After enjoying a great week at the Cape (Cape Cod) it's time to finish preparing the Freezer Jams to enjoy during the other months of the year. Now, it is peach season! The local crop is so sweet, juicy and just plain yummy. This past Thursday at our Farmers' Market, I purchased enough of this fresh fruit to make a batch of Peach Freezer Jam and also more that we could enjoy now. 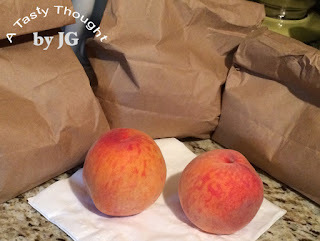 They were not quite ripe, so 3 peaches were placed inside a brown paper lunch bag and the top closed. In 2 days they riped, so the fresh peaches were placed in the fridge. Yesterday, 7 peaches were used to prepare the delicious jam! The sugar, lemon juice and Certo (liquid pectin) were all placed in their places on my kitchen counter. The mixing bowls, spoons and measuring cups were added, along with the clean containers & lids. I was getting down to business! It was time to prepare the Peach Freezer Jam!! After rinsing the peaches under cool water, the skins were removed. It is easier to remove the skins if you place each peach in a pot of simmering water for about 60 seconds. A slotted spoon comes in handy here to place it in the water and also to remove it. Let the peaches cool a little on a plate lined with a paper towel. Use a sharp knife and peel the skin. Cut peach into slices. Then, it's mashing time! Mash the slices (a few at a time) with a (potato) masher. Measure out needed amount and add to the required sugar in a large bowl. Then, I was on my way to follow the rest of the directions that are included in the package of Certo. ~My Hints~ are handy to read! Freezer Jam is just so delicious! I am not a fan of commercial brands. While growing up, my mom, sister & I always prepared jam the "cook over the stove" method. For years now, I've been making Freezer Jams. Yes, they are that good!! ***After following the directions, exactly (that are located in the Certo box) the jam containers then sit undisturbed for 24 hours. After that time they are placed in the freezer. 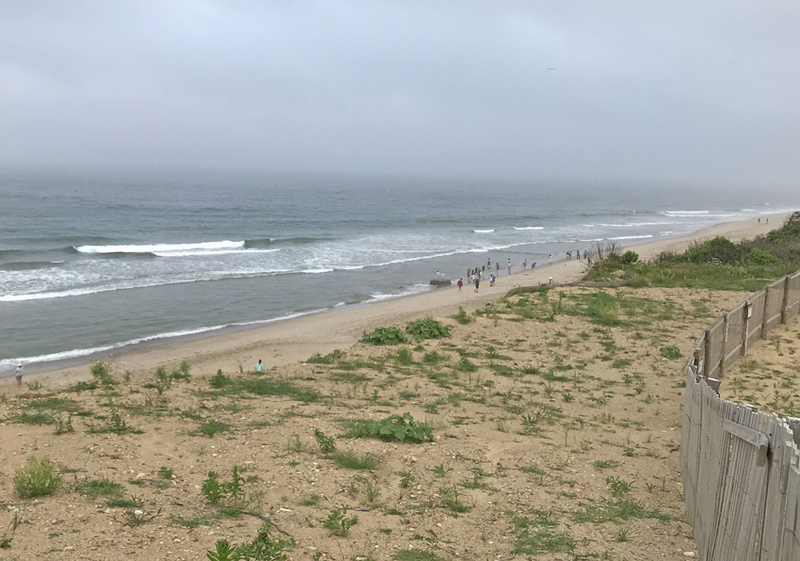 Yes, I was daydreaming about the surf crashing on the shore two weeks ago at Nauset Light Beach while making jam yesterday. 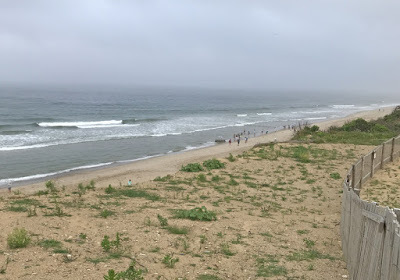 We did see seals swimming at Nauset Beach, Coast Guard Beach and Nauset Light Beach. It has been the summer of sharks looking for seals in the waters at the Cape. 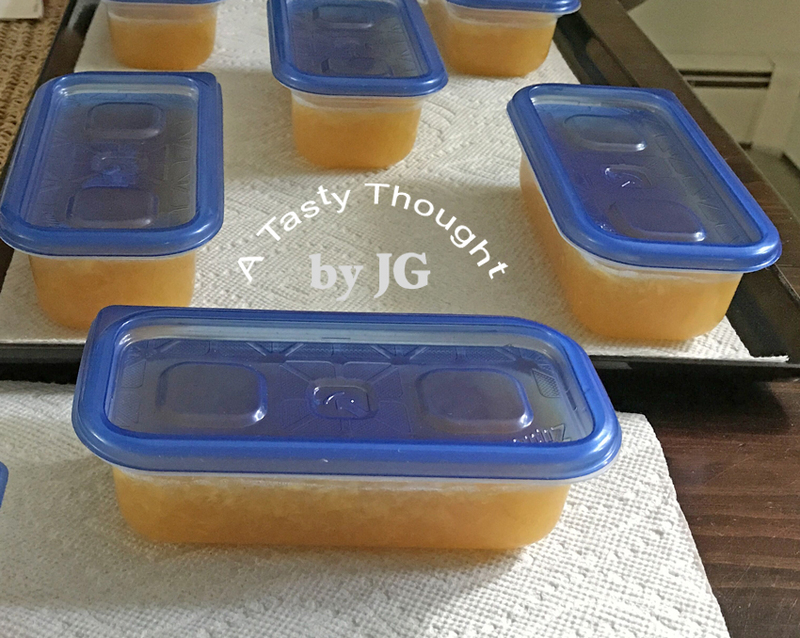 My Peach Freezer Jam is now in our large freezer. We'll enjoy it along with the Strawberry & Blueberry Jams in the coming year. Hopefully, again, there is enough to last until next June!